The outperformance of U.S. over foreign stocks in recent years has led some investors to question why they should include international investments in their portfolios. However, a quick review of history illustrates the benefits of global diversification. Performance leadership tends to cycle across different geographies over time, and has swung back strongly in favor of international investments so far in 2017. Many different economic factors—such as gross domestic product (GDP), interest rate differences, currency movement, political events and even investor sentiment—can influence which region currently leads in performance. But because the landscape is constantly shifting, spreading investments across the globe can help your portfolio to benefit from whichever region is in favor at any given time. Figure 1 below shows clearly why some investors have sought to avoid international stocks in recent years. From 2010 through 2016, U.S. stocks returned nearly 13% per year, while international developed market stocks returned about 4% per year, and emerging market stocks only about 0.5% per year. With those return differences, it's no surprise that investors have developed a strong preference for U.S. stocks. Notably, through the first four months of 2017, international investments have again taken the lead. International developed markets are 3 percentage points ahead of U.S. stocks, and emerging markets have nearly doubled the U.S. return. A quick review of previous decades further illustrates how performance leadership shifts across different regions over time. The decade of the 2000s shows how U.S. stocks can underperform international investments over extended periods. This period is often referred to as the "lost decade" for U.S. stocks because they failed to deliver any gains over the entire decade, actually declining about 1% per year. By contrast, international developed markets returned a bit more than 1% per year, and emerging markets rose nearly 10% per year. An investor holding only U.S. stocks likely would have experienced significant regret from failing to diversify globally. 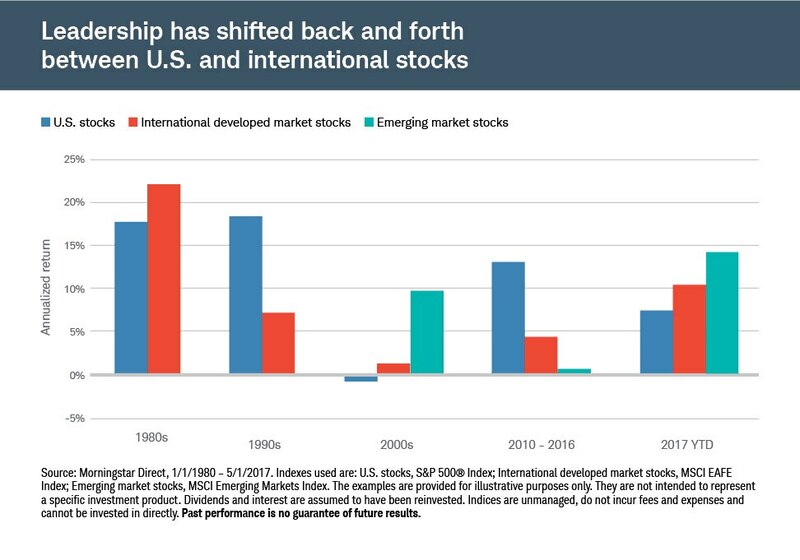 By contrast, the 1990s was a decade that significantly favored U.S. stocks, while during the 1980s international developed markets had the strongest gains. One of the reasons for the underperformance of international stocks in recent years was the U.S. dollar's rapid rise from mid-2014 through 2016. When the dollar is worth more compared to other currencies, returns in those currencies are lower when translated back into dollars. As a result, a strong dollar hurts the performance of international investments for U.S. investors. Currency movement is notoriously unpredictable, however, and the dollar can't strengthen forever. In fact, it has already weakened a bit in 2017, providing a tailwind for international investments held by U.S. investors. Additionally, valuations matter. As of the end of the first quarter of 2017, the S&P 500® Index (an index of large-cap domestic stocks) had a price-to-earnings (P/E) ratio of approximately 17.6, based on forward-looking earnings. By contrast, the MSCI EAFE Index (an international developed market index) had a lower P/E of about 14.8, and the MSCI Emerging Markets Index P/E was about 12.1.1 Although valuation is a poor predictor of short-term performance, it has historically had a strong relationship with long-term investment returns. To be sure, earnings estimates could be cut due to potential economic pressures in the future. But lower starting valuations have historically tended to result in higher returns over the long run. Because it's impossible to know ahead of time which investments will do best in the future, we believe a better approach is to diversify across asset classes and geographies to ensure that you have exposure to the leaders, while not being overly concentrated in the laggards at any given time. In spite of all the evidence that you should diversify internationally, you might still be reluctant. Maybe you feel comfortable investing in "what you know," and what you know is the U.S. This tendency for investors to concentrate on their own country is known as "home country" bias and can leave you with little exposure to a wide swath of potential investments. U.S. companies represent just about half of global market capitalization and only about a quarter of global economic activity as measured by GDP. That means that international investments represent a large portion of the global opportunity set. And they offer a chance to enhance portfolio diversification by investing in foreign companies that have different characteristics and economic drivers than U.S. companies. That diversification helps reduce the concentration risk of investing in one region, offering a potentially smoother ride over time. Schwab Intelligent Portfolios are structured to have global exposure across geographies and asset classes. This broadly diversified approach can help mitigate the impact of major market events in any one region and position you to take advantage of the global opportunity set while staying focused on your longer-term investment goals. 1. Charles Schwab Investment Advisory, as of 6/24/2016. Forward P/E measures the valuation of a company based on the current price of its stock divided by analyst estimates of the company's earnings per share over the next 12 months. CSIA estimates are based on forward earnings from IBES and index price data from Bloomberg. International investments are subject to additional risks such as currency fluctuation, geopolitical risk and the potential for illiquid markets. Investing in emerging markets may accentuate these risks. Investing involves risks including loss of principal.